What was “confessionalization“? How did this affect Catholicism in Europe? Confessionalization – creating fixed identities and systems of belief for separate Churches. Even though different schools of thought had different theologies and doctrines, they didn’t really have the idea of establishing a different identity for themselves. They all considered themselves disciples of Christ, but now they could identify themselves as separate from what other Christians believed. Pretty much this was the end of a the idea of a unified Church in Europe. On one hand this prevented a rival unified non-Catholic church from emerging that could be equivalent in size and power, but this idea also ended the hope for the reformed churches from rejoining their Catholic brethren to be a single true Church. With the creation of so many recognized churches, there was for better or worse more choices. It was also good for Catholicism in that with choices, Catholicism was also a viable one. With the recognition came legal protections so one could not oppress opposing views. This included if one wished to be Catholic. Overall there were pluses and minuses. 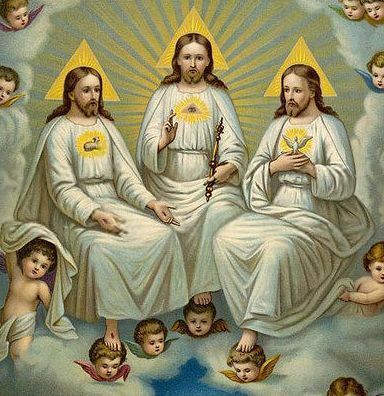 Does The Trinity exist? Are there 3 Persons in the ‘Godhead’? This controversy seems to have been with us since the inception of the Church itself. Here are some points which Antitrinitarians use to support their case. There is NOWHERE in the Bible that the term is used. ALL uses and definitions of it are from INFERENCES made not by the original Apostles, Disciples or early Church but years after them in reaction to heresies. In the greeting of NO NT letter does the author – Paul, Peter, John…- refer to the Holy Spirit yet they profusely send greetings from the Father and the Son. This omission is an INSULT to the Holy Spirit unless they did not recognize it as a Person. The Gospel of John uses the term Paraclete but why need this word to refer to a person? In Proverbs, for example, Wisdom is referred to as a woman yet NO one takes this to be a literal person-let alone a female or further God’s consort. The same can be said for the famous “Baptismal Formula” in Matt 28:19. It all can be understood without being a real person. Finally, the onus is really on the expounders of the Trinity Doctrine to produce good evidence that the Holy Spirit is a Person. The kingdom of Bohemia had been ruled by the Habsburg dynasty for over a century by the early 1600s. The Bohemians had resolutely held onto their established Hussite or ‘Utraquist’ Church traditions that were established during their fifteenth-century risings against the Holy Roman Emperors. So the Bohemians were against any Habsburg or Catholic encroachment. In 1618, the Bohemians began to defy the increasing self-assertion of the Habsburg dynasty upon their kingdom. They searched for a Protestant monarch to assume the mantle of defending their independence and their Utraquist beliefs from the Habsburgs. In 1619, the Bohemian nobility elected Friedrich V to be the next king of Bohemia, who was thoroughly Reformed and also began creating a stir across the continent as a possible leader against the Pope. (loc. 12520). During this time Transylvania, aided by Ottomans, started to make its mark against Habsburg rule by taking over the Hungarian throne by routing Habsburg armies there. The Habsburgs countered against this insurgence and quickly regained the kingdom of Bohemia thanks in large to Friedrich’s growing unpopularity; many conservative Uraquists were outraged by the iconoclasm which his Reformed preachers encouraged in Prague and his Reformed faith grew to isolate many of his Bohemian supporters. Finally in 1620, the Habsburgs defeated Friedrich at the Battle of White Mountain. Almost immediately, Protestantism in Bohemia would undergo the repercussions of their rebellion and loss to the Habsburg Empire. The Habsburg Emperor Ferdinand dismantled a century of safeguards for Protestantism and two centuries of established status for the Utraquist Church. (loc. 12527) Severe restrictions were also placed upon Protestantism in Austria as well. A strong version of the Counter-Reformation would be instituted across to the Habsburg Empire to establish a Catholic monopoly and declare Catholic dominance throughout, which was quite an accomplishment considering that in 1619 around 90% of the Bohemian population were not Catholic. (loc. 12530) In 1629, Ferdinand instituted the Edict of Restitution which in effect restored lands that were previously lost back to the Catholic Church and outlawed Reformed Christianity throughout the empire. Greater Europe felt a general unease with the Habsburg victory among both Protestants and Catholics. Emperor Ferdinand’s actions against Protestantism provoked many in Europe to take up arms. Catholic France and Lutheran Sweden would be involved in several destructive wars, one of which was the Thirty Years War. Here we see the effects once again of politics, power, and religious belief mixing together to incite violence and warfare (particularly Christian vs. Christian violence which I believe far exceeds Christianity against any other religion or movement) – an all too common theme as we’ve seen time and time again throughout church history. Religion and politics stir up so much powerful emotions within people, and both become intertwined particularly in conservative circles in America. Can Christianity and politics ever come together to produce something good and beneficial to society as a whole? One can look at the civil rights movement, especially the non-violent efforts of Dr. Martin Luther King, to use politics and the gospel to bring about powerful and lasting change. Can we ever lay aside our differences, self-interest, and polemics – conservatives vs. liberal, Protestants vs. Catholics, or even Muslims vs. Christians – and our us vs. them mentalities, and rather see our commonalities as followers of Christ and forge a new future for the Church at large? Or are these divisions and tribal instincts too entrenched within us that history has to repeat itself over and over again? Granted that there aren’t many large-scale Christian vs. Christian conflicts in the modern era, but certain animosities still remain. Are the atheists correct when they say that true worldwide peace will come when people stop believing in God and following religion?